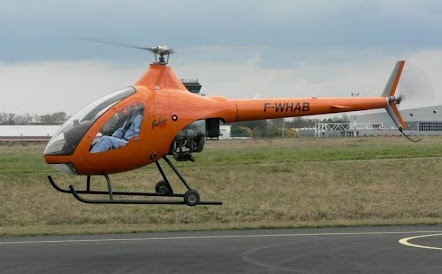 The Fandango F360 is an all-composite ultra-light helicopter created by the BHR company of France. Development and production of the F360 is in association with the French Sébadour Mecabasque and Spanish Burdinberri companies respectively. Very little information is available about the Fandango at present. Manufacturing of the aircraft is to take place in Bayonne at the BHR-Helitechnica factory. The F360 Fandango is meant for flight-school use and is one of the very first ultra-light composite French aircraft. There is another version known as the Mustang which is meant for civilian sales. The Fandango has not metal frame at all and the entire craft consists of honeycomb carbon fiber composite. This is of course possible not only because of the great strength of this material, but because of the small size and low mass of the helicopter. This is also why a single 180 horsepower Lycoming HIO 360 is enough to get the helicopter and both occupants airborne. The total weight of the craft itself is only 700 kg (1543 lb). The current estimated price for the Fandango is 175 000 Euros and the Mustang is set to go for 145 000. As it stands there have already been 25 order for the Fandango and 15 for the Mustang. Do you want to comment the BHR Fandango F360 helicopter?